Redeem the Planet 7 Casino no deposit bonus code 65NDB and receive a $65 free chip! No deposit required! 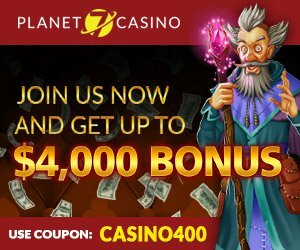 Make a deposit at Planet 7 and receive a 400% bonus! After the $65 no deposit bonus, make a deposit with coupon code CASINO400 for a 400% bonus & play the latest slot games like Naughty or Nice 3! Planet 7 Casino is an established and popular online casino. The casino is U.S.-facing, caters to players from around the world and offers many different bonuses and other promotions for new and existing members alike. A number of these bonuses don’t require any deposit at all! Planet 7 Casino is currently welcoming new members with a free $65 chip. This is a no deposit bonus, which means that you don’t have to deposit a single cent and can claim the chip just by registering a new account. Once the bonus is claimed, the $65 is deposited to your account and you’re able to use it at the casino however you see fit. You could, for instance, bet the entire amount on a single spin of a roulette wheel, or you could place a 50-cent bet on your favorite slot machine 130 times. None of the games at the casino are off-limits, and it’s even possible to cash out without having deposited anything at all. The promo code for the $65 free chip is 65NDB. This is important because there are other free chip opportunities available at Planet 7 Casino, but this is currently the best one. Most online casinos limit these kinds of bonuses just to new members, but that isn’t the case at Planet 7. It’s open to any member that has less than $5 in his or her account and whose last bonus was not a no deposit bonus. If you don’t yet have a Planet 7 account, go ahead and register. 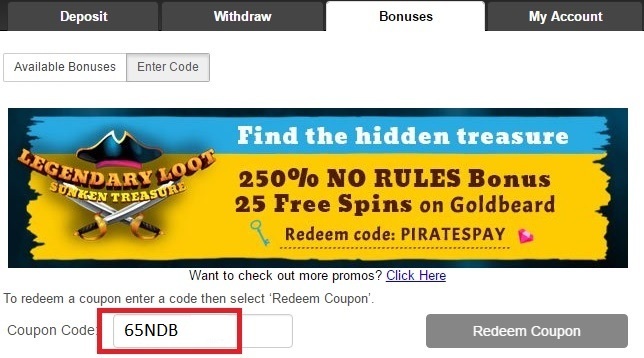 You’ll then be able to log in, go to your bonuses page, enter the 65NDB promo code and claim your $65 free chip. 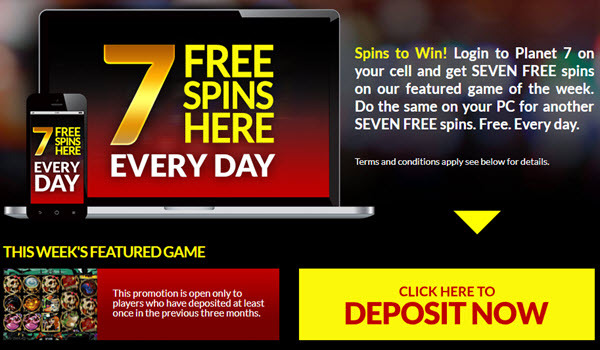 Click here to redeem the $65 Planet 7 no deposit bonus code! You complete this no deposit bonus either by reaching an account balance less than $1 or requesting a withdrawal, which is possible as soon as you win. Be mindful that if you were to request a withdrawal prior to playing through the entire $65, whatever remained would be lost. Maximum withdrawal is limited to $100 in this case. Any amount beyond that is lost. There is also a standard playthrough requirement that applies to this bonus. The rollover requirement is 30x if you stick to slots, scratch cards and keno but increases to 60x if you played any other games. This applies to the entire bonus, so even if you bet $64 on slots and $1 on blackjack, your rollover requirement would 60x for the entire bonus. You are able to claim bonuses at Planet 7 Casino consecutively, but you need to have completed your current bonus and have a balance of less than $5 in order to be eligible for a new bonus. Note that this only applies to bonuses you claim. There are bonuses, such as weekly cashback, that are awarded automatically. Additionally, you cannot claim offers involving no deposit bonuses, free chips, free spins and so forth back to back. You have to at least made a deposit with real money in between. Claiming a deposit bonus on such money is an option but not required. In addition to the $65 no deposit bonus, you can also redeem these other Planet 7 bonus codes! If you’ve joined Planet 7 Casino and played through your $65 free chip and now want to make a real money deposit, the casino offers a 400-percent bonus. Claiming this bonus requires just a minimum deposit, which depends on the deposit method you choose but is usually around $30. It may behoove you to deposit more, however, since the casino will match your deposit four times up to an impressive $4,000. So, if you deposit $30, you’ll get a $120 bonus. If you deposit $100, you’ll get $400, and if you want to max out the bonus, then you’ll need to deposit at least $1,000. For this deposit bonus, you’ll need to use promo code CASINO400, and you can either input that code at the bonuses page or while making a deposit. The wagering requirement is the same as listed earlier: 30x for slots, scratch cards and keno and 60x for all other games. Note that how Planet 7 Casino handles deposits and bonuses is a bit different than many online casinos. It will give you the bonus but withhold your deposit. Once you’ve have finalized your bonus, an automated system will immediately deposit the real money into your account. This approach does make it easier to track bonus versus real money. 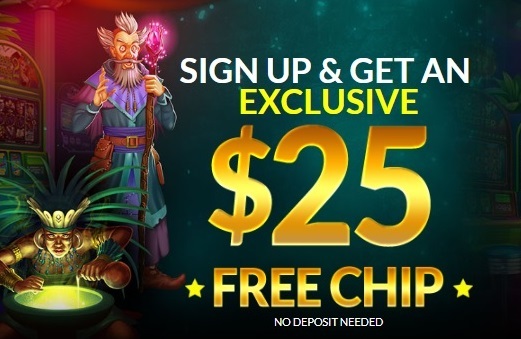 Planet 7 Casino also has a standard $25 free chip that’s available, and since you’ve now made a real cash deposit and perhaps played through a deposit bonus, you’re eligible for it! The promo code for this free chip offer is 25FREECHIP, and you can enter it on the bonuses page if you’re eligible. Once the free chip is claimed, a $25 bonus will automatically be applied to your account, and you’re free to start using it right away. The terms and conditions and so forth are just like with the $65 bonus for the most part, and you’ll want to stick to slots, scratch cards and keno to keep the rollover at 30x. A difference to note, however, is that maximum withdrawal on no deposit bonuses with a total face value less than $50 is $100. That means that you could actually withdraw more on this than the $65 free chip. So, that’s the last of the free chips for right now. You’ll have to wait for a new no deposit promotion to come along. But the good news is that there are a lot of other deposit bonuses available as well as offers for free spins that you can claim in between your real money deposits. Free spins are like free chips except that they’re locked into a certain amount, such as 5 cents or $1, and they’re often restricted to a particular slot machine or series of machines. The wagering requirement will never be greater than 30x since you can only play slots. The maximum withdrawal is the face value of the spins, but remember that if the total face value is less than $50, then the maximum withdrawal is kicked up to $100. Sign Up to the Planet 7 Casino Today! You can find additional information on any available Planet 7 no deposit promo codes at BettingSitesUSA.net.